Ramolene™ Pipe Cleaner No. 620 is a special blend of solvents formulated to clean PVC, CPVC, ABS and Styrene Pipes & Fittings, all schedules, and all diameters, prior to applying cement. This Pipe Cleaner will effectively remove oils, dirt, grease, and other foreign matter from the surface of pipe and inside of fitting. It is very important the surface of pipes and inside of fittings is clean for a strong leak proof joint. 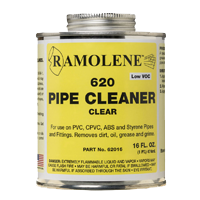 This product is made in the U.S.A.
Ramolene™ Cleaner may be used on PVC, CPVC, ABS and Styrene. 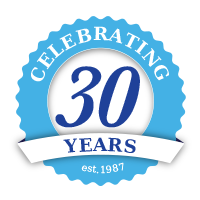 Use applicator supplied with can or suitable applicator 1/2 the size of pipe being joined or clean cloth.